The following statements invoke the TTEST procedure to test if the mean test score is equal to 30. The count variable contains the frequency of occurrence of each test score; this is specified in the FREQ statement. The output, shown in Output 103.2.1, contains the results. The SAS log states that 30 observations and two variables have been read. However, the sample size given in the TTEST output is N=44. This is due to specifying the count variable in the FREQ statement. 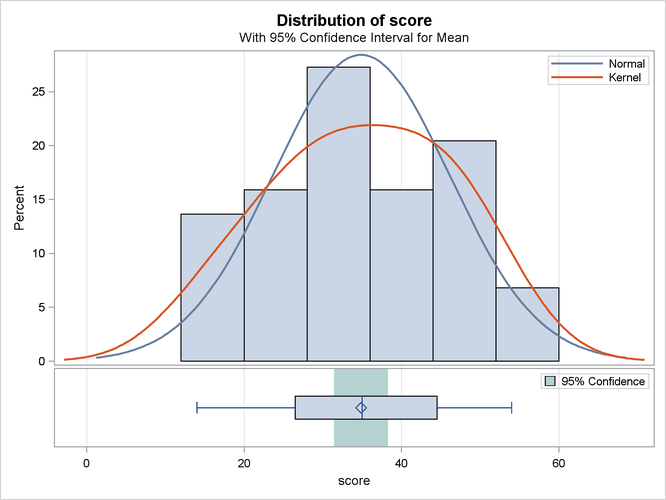 The test is significant (t = 2.87, p = 0.0063) at the 5% level, so you can conclude that the mean test score is different from 30. The summary panel in Output 103.2.2 shows a histogram with overlaid normal and kernel densities, a box plot, and the 95% confidence interval for the mean. 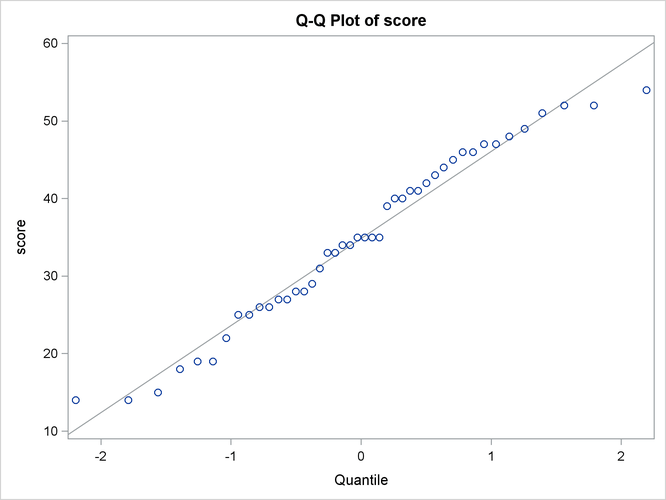 The Q-Q plot in Output 103.2.3 assesses the normality assumption. The tight clustering of the points around the diagonal line is consistent with the normality assumption. You could use the UNIVARIATE procedure with the NORMAL option to numerically check the normality assumption.